Our first night in Paris we were very tired. Like many flights to Europe from the eastern US, our flight was an overnight flight and got in at 9:30 am. We spent the afternoon walking around in hotter than expected weather and around 4 pm, we called it quits and went back to the hotel. But what about dinner? We knew we had to eat, especially me because my stomach gets angry if I don't feed it on its idea of a schedule. I did not want to spend the next day desperately seeking a bathroom after eating for the first time after skipping a meal. But in France, people eat later. Many restaurants do not open for dinner until 7 pm. Even if a brasserie/cafe is open in the afternoon, sometimes the kitchen isn't and won't open until closer to that 7 pm dinner time. We did not want to wait that long (even though we eat dinner around 7:30 pm at home). So we decided to try the tavern that was a 1 minute walk from our hotel: Taverne de l'Arbre Sec. It was here that we (well, I) pulled out my high school French for the first time. I didn't have a clue what was said to me so I put on what I hoped was a 'please forgive the stupid American' smile and said,"Parlez vous Anglais?" "Oui, Madame." Oh thank goodness, because my brain was fried from lack of sleep. 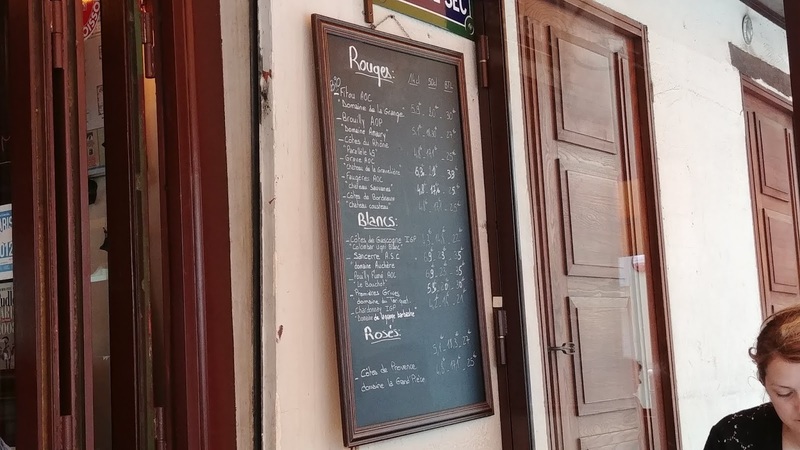 (I did know from their website that they have an English menu, so I was hoping they spoke a little English, too, but we were prepared to muddle through with the help of Google Translate). We were seated outside under the yellow awning. It was around 5:30 pm and it turned out that the kitchen didn't open until 6 pm, but we figured we'd have a drink and think about what to order for half an hour! 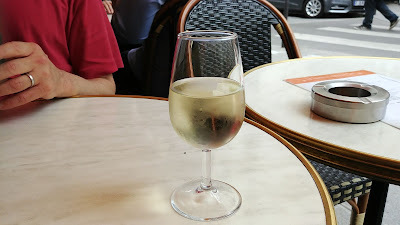 I saw they had sancerre on the wine list, so that's what I ordered because I rarely see sancerre on wine lists here. It was quite nice. 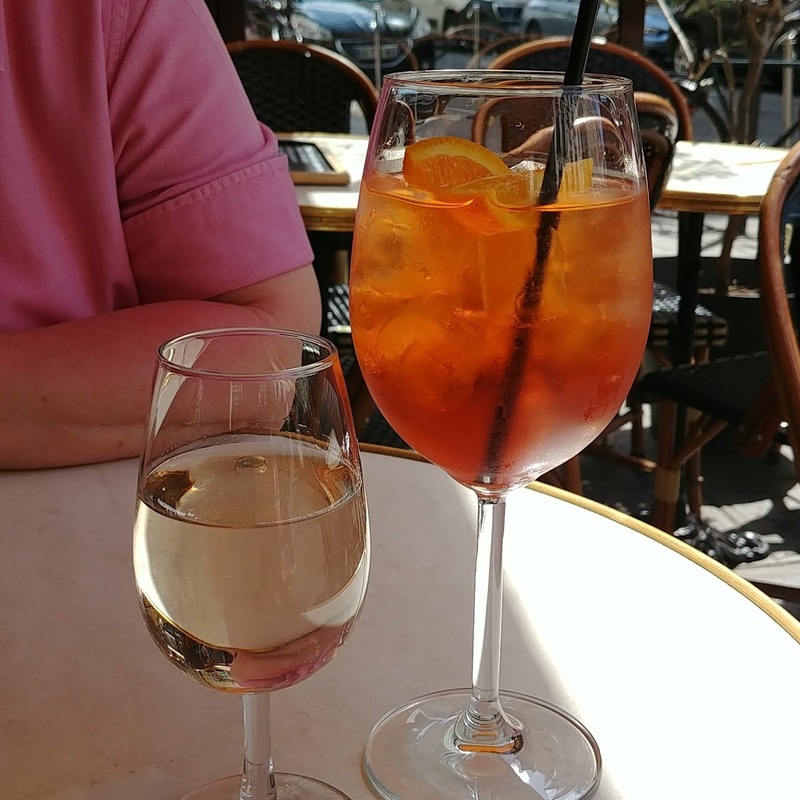 After the sancerre, I tried a rosé. 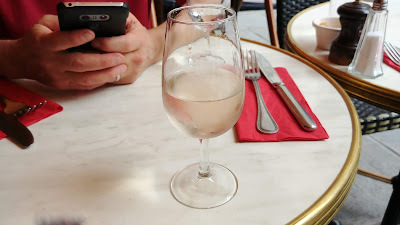 It was quite nice, too, a super light pink color, and I was pleased to find a rosé I like. 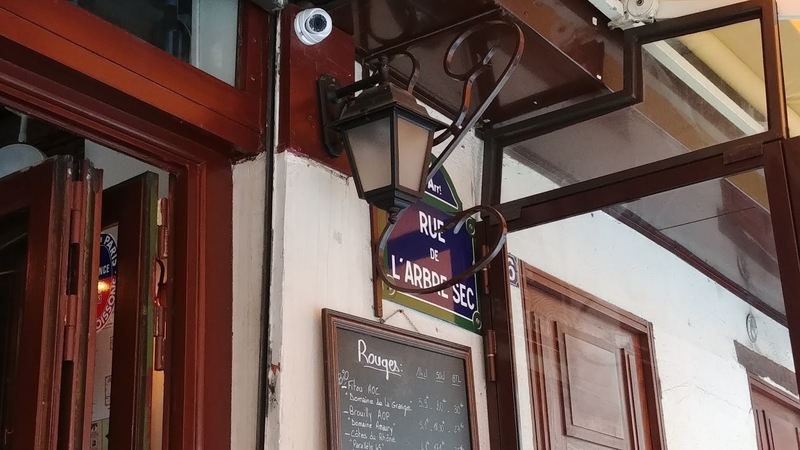 We ate at Taverne de l'Arbre Sec twice, and stopped by for drinks a few times. Croque-Monsieur (country bread, white ham, emmental cheese + salad). 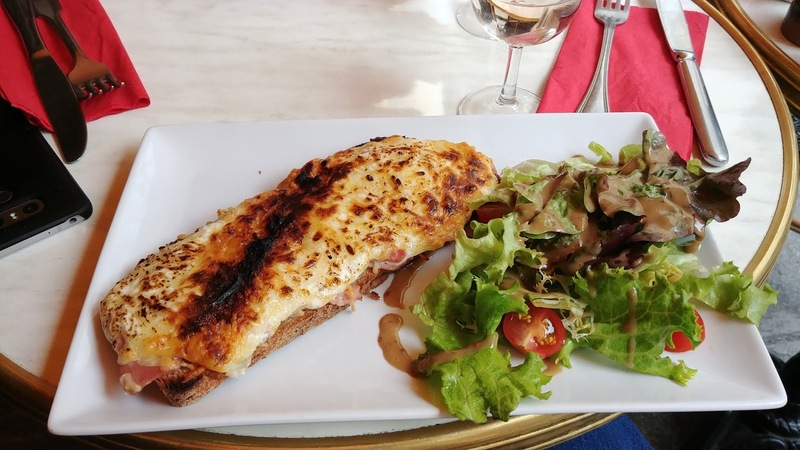 I ate several croque-monsieurs while in France and this was one of the top 2. It sort of looks small, but it was not. It was definitely big enough for me, plus SP's help with the last couple bites. 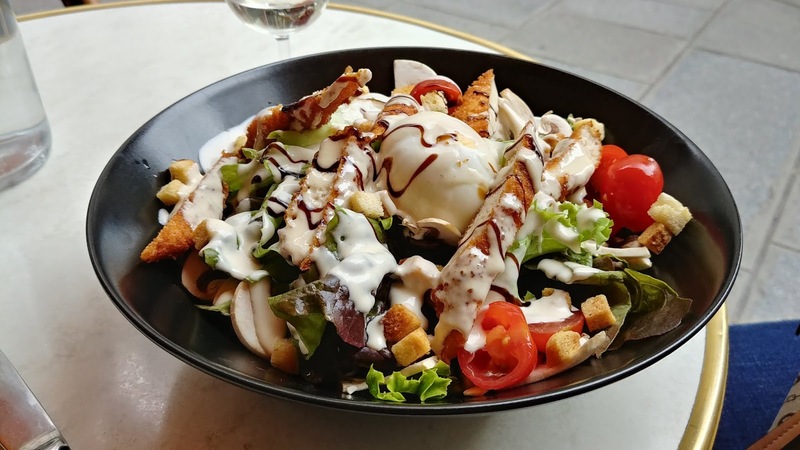 Caesar Salad with chicken. A filling salad with chicken, mushrooms, poached egg. 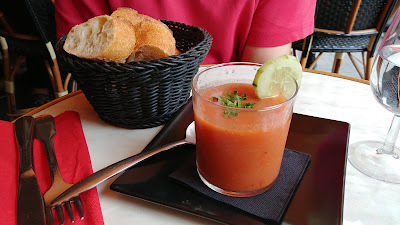 Gazpacho - one of SP's favorite soups. He said he wasn't hungry the first night but then he hoovered up the soup and all the bread in the bread basket and then helped me finish my croque-monsieur. 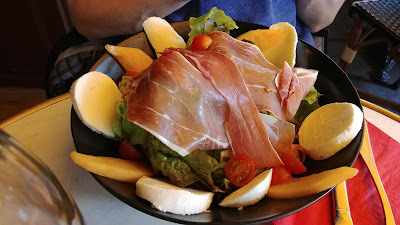 Italian Salad - with lots of prosciutto & mozzarella & melon. Yum! Shepherd's Salad - with fried goat cheese, apple, mushrooms. Really good as well. I did find the goat cheese a little different from goat cheese here, maybe grassier? Tangier? Stronger? More drinks - rosé and Aperol Spritz. We really liked this place. 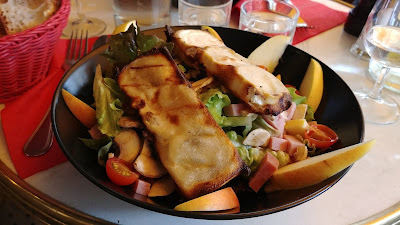 We liked the excellent croque-monsieur and the large, tasty salads, especially since we are always mindful of eating enough vegetables while on vacation. The 3-4 people who worked there were super nice and friendly, spoke enough English and us enough French that it was not stressful or difficult. They have an English menu. I had read that the French can be particular about special requests to meals, like dressing on the side or something left out, but we asked nicely for dressing on the side, if it was possible, and they said of course. And it was super close to our hotel.